Question 2: There are many names in the soft clay. How do I recognize the soft clay I am looking for? 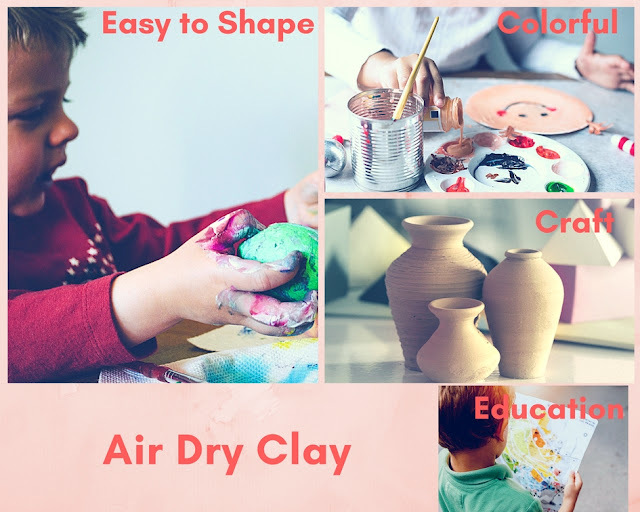 When you searched air dry clay or soft clay on the shopping platform, there will be light clay product , but why some product titles appeared "super light clay" , "bouncy clay" , "magic clay" etc. They seems to be light clay, or not? In fact, these words can be used to call the light clay, they are named by features of light clay! In order to avoid buying bad quality or inappropriate clay, you can ask the seller before place the order. Question 3: How should clay be preserved? This question is often asked by buyers from different countries. How do I save the clay so that keep clay fresh? In fact, the latitude of each country is different, and the temperature and humidity generated are one of the keys to the preservation of clay.For example, light clay is a kind of “water-based” clay. When it exposed on the air, it is easy to harden due to evaporation of water. In order to keep the light clay in good condition, there are some methods can maintain clay freshness. The clay was completely covered with plastic wrap , and be placed in a sealed box. In this way , the clay will be fresh as the new one when it is used next time. Extensive reading: If the oil modeling clay does not belong to water-based clay, is it air dry? Question 4: Why does clay easy to harden? This problem is easy to happen to handmade beginners! They usually put the clay on the hand for a long time, and the hand heat will accelerate the evaporation of the clay water. Therefore , when the work is not finished , the clay is already dry or cracked. 1. Apply Vaseline or baby oil to your hands. That will let the beginner moisturize the surface of the clay during the molding process. 2. Wake up the clay! When you unpack the new clay, we need knead clay at any way! Because the clay is still in a "sleeping" state , we can mix the air with the clay by any method of kneading , it will increase use time of the clay and let clay's feature completely present. Question 5: What kind of clay is the suitable for making "flower"? All clays are suitable for making flowers, or any meticulous works, the difference is only the touch after completed work and the difference visual due to different clay characteristics. If you use light clay to make flowers, the finished works will be a little shallow fingerprints on surface and the color will be softer, the touch will be smooth and a little bouncy. If the flowers are finished with paper clay, the surface of the works will a bit rough and hard to touch, but paper clay's finish works can be painted by watercolour or crayons to make your works look more colorful. The above is the question we collected in July. Are there any questions that have not been answered or what you want to ask? Welcome to contact us on the blog or the official website!